List notes can be used on any of your private or shared Lists. On shared Lists, notes can provide useful context or action items for other collaborators. 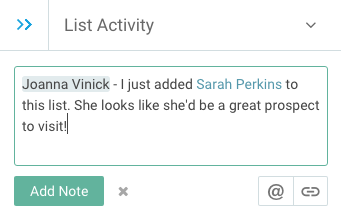 Within notes, you can also mention a colleague or link to a specific constituent profile. Note, you can use the two blue arrows on the top left to collapse the List Activity feed as needed. Use the down arrow on the top right to change from List Activity to Similar Constituents. You can mention a colleague in a note by typing the @ symbol, then selecting their name from the suggested list. You can also begin to type your colleagues name immediately after the @ symbol to narrow down the suggested list. Mention colleagues to draw their attention to a change you’ve made, ask them to help you out, or take a look at a specific constituent. If the person you mention is already a collaborator, they will receive a notification that includes the note's content. If they’re not already a collaborator, they will automatically be added to the List and receive a notification. You can mention specific constituents by adding the $ symbol, then selecting their name from the suggestions list. You can also begin to type the constituent's name immediately after the $ symbol to narrow down the suggested list. Constituent mentions form a direct link from your note to the constituent’s profiles. This is useful if you want to add commentary about why you added or removed a constituent from the List, or ask somebody to take a look at a profile in more depth. Click the note composition box at the top of the List Activity feed. Type your note, using the “@” character to mention colleague and/or the "$" character to link a constituent profile. Click Add Note when you’re done to publish! On any tab in the List, tap the “compose” icon at the top right of your screen. 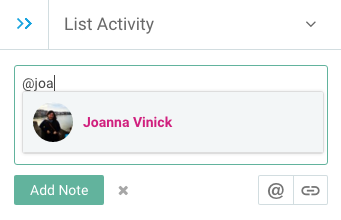 Type your note, using the action buttons to mention a colleague or link a constituent profile. Tap Submit when you’re done to publish!